We had a great time at the Sew Pro Convention in Chicago in September (you’ll hear more about it in episode 204 coming out tomorrow), and one the people we got to meet was Brenda Ratliff, the great mind behind Pink Castle Fabrics and the Just a Bit Frayed blog. For reference, she’s between the real Tula and the ad-Tula in this photo. No, not the Aquafina water bottle, the lovely lady behind it. Random aside: you can tell Rae and Pam were on their own that morning because there’s an Aquafina bottle and not a Dasani bottle. Lynn is very brand-loyal to Dasani. Anyway, Brenda invited us Sew Pro attendees to participate in her Stargyle quilt along, so Pam is jumping in to use some pre-cut scraps and bits from her sewing room. You don’t have to have been at Sew Pro to participate, though, so check out this cute pattern if you want to play along, too! Of course I’m is being the Sally (of When Harry Met Sally fame – shout out to another 80’s reference – wooot!) and not quite following the instructions. Brenda is calling for 2 1/2″ squares to start for the 4-patches, but my scraps are cut to 2″, so my lap size will end up a bit smaller than others. It requires a little math, but a little math will save me a lot of cutting, so it’s worth it. Since I had most 2″ squares in pink and green, those are making up my four patches, although admittedly making 49 four-patches isn’t making that much of a dent in my scraps! The yellow will be used for star points, possibly, or maybe the sashing. So much fabric to choose from! 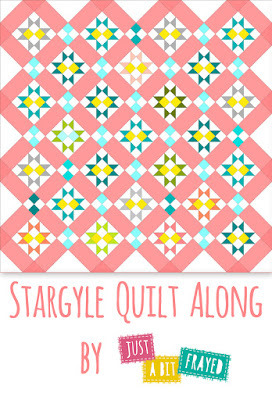 Following on with the fun over on Brenda’s blog, or on Instagram with #StargyleQuilt.